Kani uses exaggerated scale changes, texture, and color to make her work kid friendly. 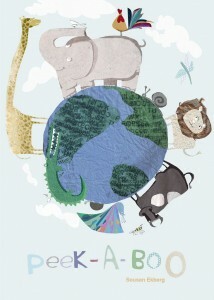 Designed as a book cover, this piece shows simplistic views of the characters on the front. Unzners work is made up of imaginary creatures, creating a wide range of possibility in design and imagination. 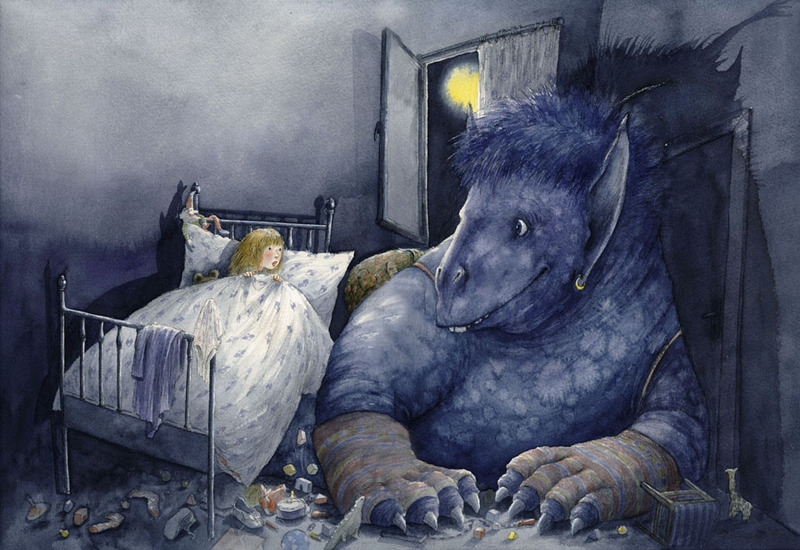 Her creatures are often extremely larger than the children depicted. She sets a dark tone yet keeps the creature smiling. Scale to body in seen in both pieces. Kani and Unzner both make their depictions much larger than another. In Kani’s book cover, we can see that she plays with size by making the animals larger than Earth. Unzner shows her scale changes by making the creatures in here drawings much larger than the children. The spaces chosen by both artists is also similar. The centered Earth, with relatively similar sized animals surrounding it, fills the space. Unzner doesn’t choose to focus on only one character, but both. They are both the center of attention in her piece. Although the creature is much larger than the girl, the size of her bed makes up for lost space, giving the illusion that both are centered. Detailing is used in different ways in both works of art. Kani uses textures, such as crumpled paper, and Unzner uses what looks like water color blots, creating a fuzzy texture. Adding on to the space choosen, both artists create a simple background to highlight the centered objects. Kani’s simple, light blue background sets a conrtrast between that and the harder color of the animals. Unzner leaves a blank, washed wall with only a window and small light to contrast the figures. Finally, both artists use color. Imagination and creativity cannot easily be seen in many black and white works of arts. Color provide a general feeling of happiness, especially relating to children.